Dog Cage / Crate Cooling Fan. $13.95. Price and quality was great. Has worked everytime I turned it on. A little assurance my dog is getting cooled off on the ride to and from training. Worked awesome. My dog was panting so much when he would go to sleep and even have central air. After I installed fan on crate, he stopped panting and slept better through the night. "it appears to push enough air to keep a dog cool when needed." The anticipated heat wave passed, so I have not really had a chance to use the fan. However, it appears to push enough air to keep a dog cool when needed. "We have always been pleased with every item purchased from you." We have always been pleased with every item purchased from you. This is no exception. "It works great for out of state hunt test when he is in his kennel." It works great for out of state hunt test when he is in his kennel. "Keeps my dogs cool at dog shows, and they love it." These have a great reputation and are portable and easy to use. Batteries last! Keeps my dogs cool at dog shows, and they love it. "Small, simple and works great. Fits in kennel cover pocket when not in use." Small, simple and works great. Fits in kennel cover pocket when not in use. We had already purchased one of these last year, and now we purchased another one for our puppy's kennel when she's inside the truck. Works great! "It fit nicely on the kennel and can be placed pretty much anywhere on the kennel." Works perfect for moving air in Whitey's kennel. It fit nicely on the kennel and can be placed pretty much anywhere on the kennel. "Seems to be a good thing"
Have not actually used it yet, but tried it out at home. Seems to be a good thing; I believe I could leave my baby for a short time with it. Love these fans. Batteries last. Works well. Does the trick. Only wish it were a bit more powerful, because with a big crate on a warm day 2 may be needed per crate. "Great for create and x-pen during field trial." Used the product once. Great for create and x-pen during field trial. "Good, cheap solution that works on both Vari-Kennel and Ruff-Tough style crates." Good, cheap solution that works on both Vari-Kennel and Ruff-Tough style crates. Not too powerful where it annoys dog, but enough to move air over him. It doesn't come with a power cord, but you can find the appropriate one fairly easily. It runs even faster/better with the power cord than with the D cells. Extra points if you have an outlet in the back of your truck. Is it perfect, no, but for the money it's tough to beat. Works ok. Would be easier to operate if the on/off switch was on the front (outside) of the fan. Since it is on the inside the fan must be removed to turn it on or off. "Inexpensive cooling fan. Not amazing, but does the job." Inexpensive cooling fan. Not amazing, but does the job. "Works great for Honey so far." Works great for Honey so far. We put two on the kennel door, and helped keep her cooler at Central Louisiana hunt test this last weekend. It's really simple. Doesn't offer the CFM of a fan you spend between $50-175, but that's not expected. I've used these for years. It's better than no fan. Has 2 speeds, and the price is right. Overall works great! Wish it had a little more power, but it's battery operated, so you'll have that. Cools the dog box off just enough to keep my dog nice and comfy on those hot days! "The cooling is nowhere near as good as a couple older fans I have." The cooling is nowhere near as good as a couple older fans I have. I thought I could do better with these, but they are not as strong. "The speed of the fan is not very good." The speed of the fan is not very good. For a small crate it might be okay, but for a large crate and 60 lbs dog. It's just not enough. Battery life is insufficient and unit movement of air is not adequate for very warm days. Perhaps the 3v adapter would help, but unable to locate one. I can honestly say I'm not sure we will actually use this fan. It was much smaller than I was expecting and doesn't push much air (even on high). I really don't think it will cool the dog, or even keep him comfortable. I have 2 of these, barely get any air from them. Didn't even open second fan. Volume is very long. 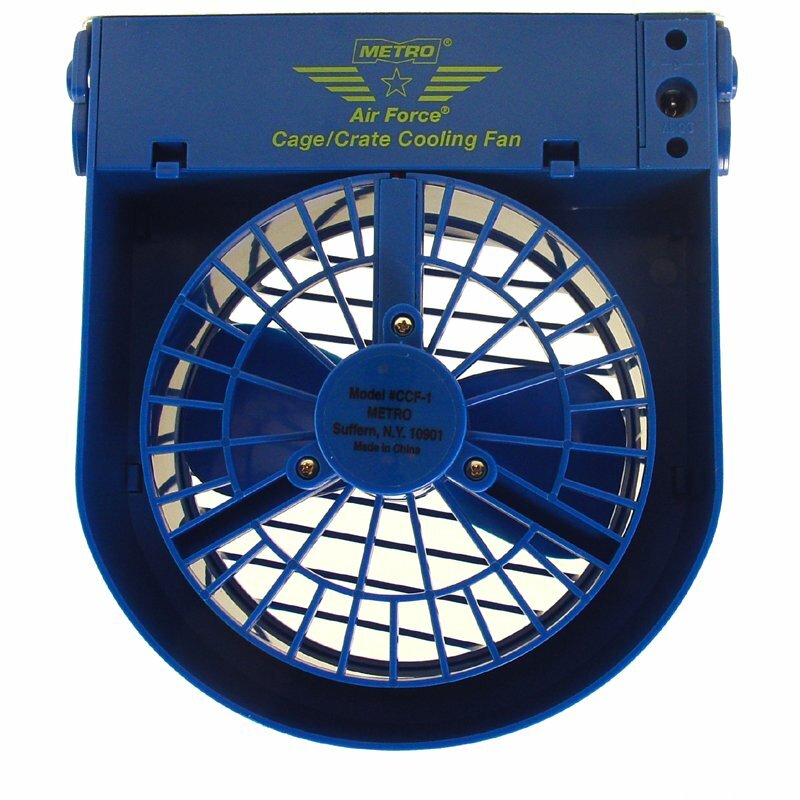 This plastic cooling fan easily clips to any cage, crate, or pet carrier. Traveling is a breeze with this fan which helps protect dogs from uncomfortable and dangerous hot weather.